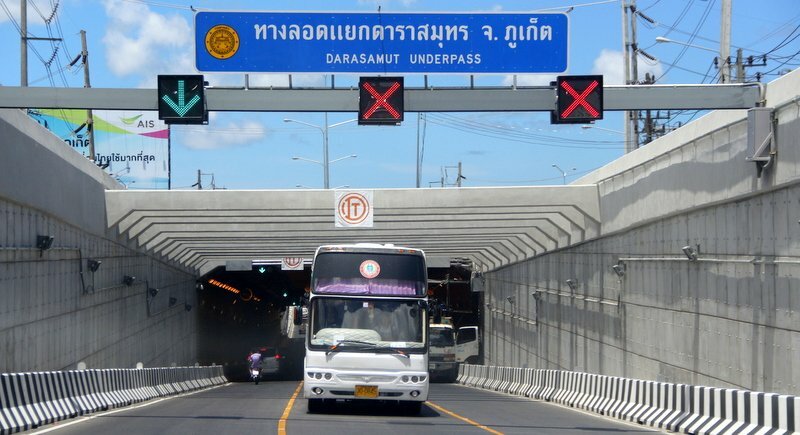 PHUKET: The opening of the B600-million Darasamut Underpass in April this year has done much to alleviate traffic congestion at the busy intersection, but mainly by force-feeding traffic to a choke point “down the road”, according to respondents to the latest online poll by The Phuket News. The Darasamut Underpass is the first of three “tunnel projects” to be completed along the bypass road. The other two – one at the Sam Kong Intersection in front of Tesco Lotus, and another at the Bang Khu Intersection at the northern junction of the bypass road with Thepkrasattri Rd – are still under construction. Each underpass comes with a hefty price tag. The Bang Khu Underpass will also cost about B600 million, but the Sam Kong Underpass will cost about B834 million, including the waylaid project to install drains along the section of road in front of Index Living Mall. The yet-to-start Chalong Underpass, borrowing under Chalong Circle, will cost another B550 million by the time that project is finally complete. Only 6% of pollsters responded, “No, it has made no difference at all”, while only one person – a Thai national – responded that he/she still still avoids the area at all costs. To vote in our latest poll, asking, “How far should venues selling alcohol be from schools or other ‘education institutions’?” click here.